An importnant and highly detailed copper-engraved map of Canada and the Great Lakes providing the most accurate rendering of the Great Lakes of the time, with the lakes fully enclosed and properly placed in longitude and latitude. There are numerous geographical misconceptions and a decorative cartouche containing the title and the scale of miles, decorated with a beaver, natives (one of whom is bearing a scalp), Jesuit explorers and centered with the French crown and coat of arms. 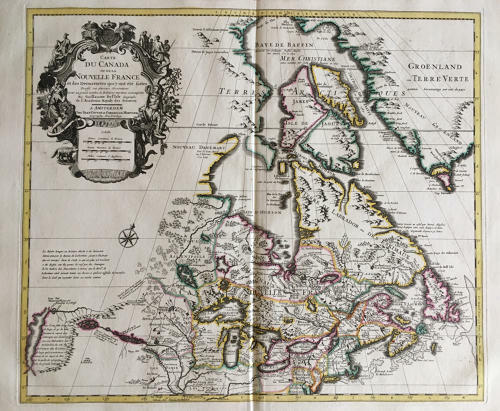 The map is from a Dutch edition of De L'Isle's work entitled, Atlas Nouveau, Contenant Toutes Les Parties Du Monde, Ou sont exactement Remarquées les Empires, Monarchies, Royaumes, Etats, Republiques &c. Par Guillaume de l'Isle. Premier Géographe de sa Majesté. It was published by Covens and Mortier, brothers-in-law who continued the firm established by Pierre Mortier. In very good condition with original centrefold.